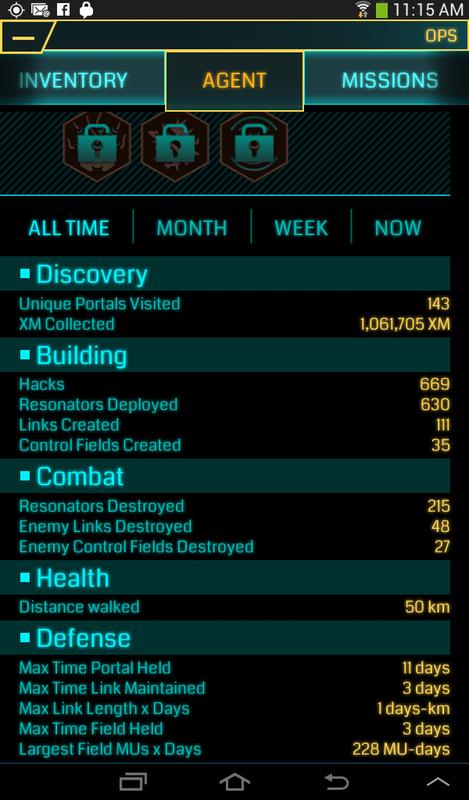 For about six weeks now, I’ve been playing Ingress. It’s a game. You could almost call it a video game—you see what’s happening on a video screen—but to play you have to go outside: The action of the game happens at specific places in the real world. The conceit of the game is that matter from another dimension is intruding into our world via portals. In our world, these portals appear as works of public art or unique architecture. Via the game (running on an Android phone or tablet), you can locate and manipulate these portals. I’ve been having a great time. I’m working with a half-dozen or so local Resistance players, some new like me, others already at level 8 and mainly providing support (since they’re no longer working to level up themselves). The structure of the game encourages team play—building a powerful portal requires multiple high-level players to work together. But the team play doesn’t need to be simultaneous, just somewhat coordinated. Lower-level players can make faster progress if they play with a higher-level player, but it’s not necessary. Besides the pleasures of loosely integrated, minimal-pressure teamwork, the other great thing about the game is that, because it takes place in the real world, to play it you have to go out in the real world. The game reports on how far you’ve walked in the course of playing it—for me, 50 km in the past six weeks. (See “Distance walked” in screenshot.) I credit that walking with helping me maintain my weight even though I haven’t been able to run for the past month. 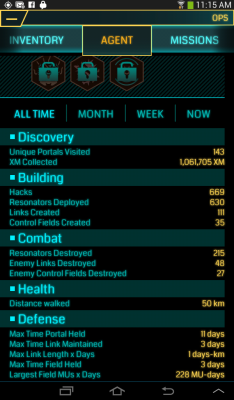 Anyway, Ingress is now in open beta. If you have an Android device, you can just download the game and go. If you’re local and play, get in touch. I’d be glad to help you level up. I was out today. I hit level 6! I also walked another 3 km.